A country which maybe had deserved a little bit more time, but which we visited in “express-mode” due to some obligations elsewhere. But in the short time that we were there, we got to know the humor of the Cambodians, their friendly smiles on every corner of the street and Angkor Wat! While rumbling through our photo-files we found this picture, which is not of very good quality, which is probably the reason why we didn’t publish it in the first place (it looks like some ISO-problem, due to bad settings – or better: not verified settings – definitely a sure indication of who took this picture ) but it sure deserves a place within “Picture in the Picture” where “quality doesn’t matter, but the story behind the picture does”. Anybody still has a bike he needs transport for? 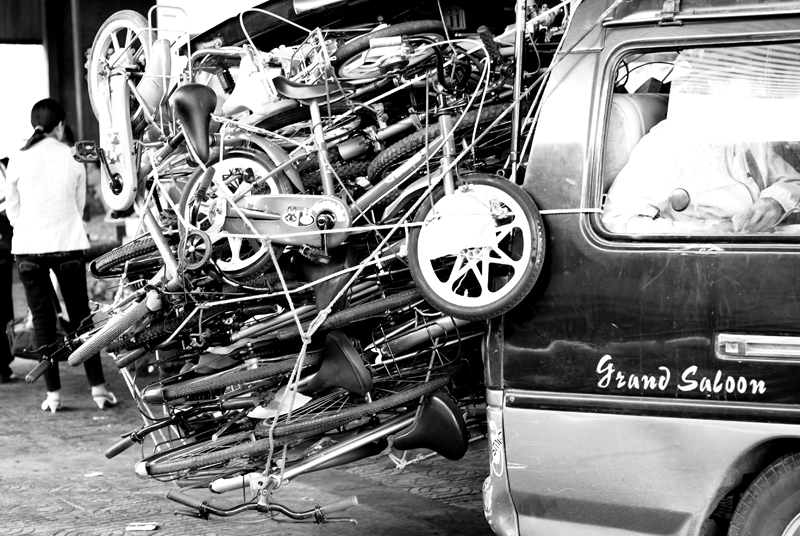 So this is a sure example of something that is very common in South-East Asia: overloading! And this is the proof, that they not only like to overload buses (yeah, yeah, 50 seats, but 120 people, what’s the problem sitting on a bag of rice for 12 hours???) but also mini-vans, cars and basically any means of transport. So anyone still interested in transporting his/her bike? There is still a loooooooot of space left!